Basak Cankes brings a new dimension to latest collection of Bashaques’, ‘’Funeral of Love’’, with her patterns, which are taken from her own oil paintings and imprinted into fabric. Patterns are describing a broken love story just like the collection does. ‘Is it the lack of appreciation, which blocks the right match in love? Or is it the lack of passion we can consider the murderer of love? Are we in love with our dream people as we cannot see and understand the reality?’ are some of the questions Basak Cankes searches answers for as she describes fashion as a psychological relief. As the pain finds its way in the fabric and materialized, a magic occurs is what she explains. For this special and inner collection, the patterns are carefully selected and prepared with an inspiration of oil paintings drawn by Basak herself. Reinterpreted collection will be put on the market in 2018 summer. Basak Cankes and her collaborative artists designed hand-painted Turkish Hammam slippers line as a part of Entrada De Gala En El Haren collection, which is inspired by adapting surrealism of Salvador Dali paintings into Turkish Miniature Art. Basak Cankes achieved the success of being the first designer who attended Contemporary Istanbul for the second time. 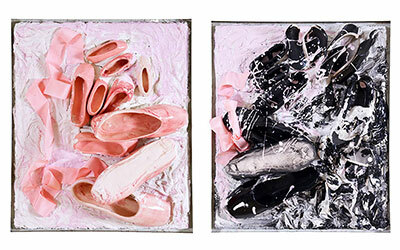 Basak participated as an artist of Gallery Baraz this time, with her paintings called ‘’To Grow Up’’ prepared by mixed technique. HOW TO DESIGN AN EXPERIENCE? Creating process for Ballerina’s Hidden Dream collection has started with designing rooms.